After discussing this with a couple of people, I realized that when thinking about the PC life for the past two years, I rarely gave any concern to PST (pre service training) . PST was just a 2 month blip that, in the grand scheme of things, meant nothing to my overall service of 27 months. Well, right now I wholeheartedly disagree. It feels like we have been here for years and thinking that I have only known my fellow trainees for six weeks is practically mind blowing. We have concluded that they make this 2 months long and grueling just so we all bond a tiny bit better. Well done peace corps, well done. The site announcements are a huge deal and staff makes it a ceremony, complete with cookies and tears (usually of joy...usually). In the weeks before placement, the staff sits down with each trainee a couple times in order to get a feel for the needs and wants of the PCV (although many people feel that it doesn't really matter what you preference and they just do it to seem like you have some say in where you end up, they give you what they give you). I decided from the very start of the PC process that I do not care where I go. I have this feeling that wherever I get placed in the world is fate and I should not mess with it, it will all work out. Plus, one of the reasons I did PC was to challenge myself and go outside of my comfort zone. I made no preference to what country, or even continent, that I wanted and I could not have been placed in a country better than Botswana. As for my village, my only real concern was that I would be placed far from other volunteers. For those who know me (especially my roommates), know that I dislike being away from people and will often sit in the living room yelling at people until they come hang out with me. I also really wanted the north but I did not want to say that out loud, for fear that if I said it and did not get it, I would be disappointed, and you really can't be disappointed if you just don't care. For those wondering, the north has all the wildlife and is hotter, while the south is not as scenic but is cooler. Once again, the PC gods helped me out and handed me just what I needed, a village called Mosetse. For those looking at a map (I'm talking to you, Janet!) it's in the central district of Bots, about 100km northwest of Francistown, and a little to the right of the Sua Pan. The trusty Wikipedia told me that in 2001 they had a population of about 1,600. And that, my friends, is literally all I know about this village. I have no idea what my house will be like, or if I will have electricity or running water. I know that it is in the region that speaks the Ikalanga language, which is pretty unfortunate because the last six weeks I've been learning Setswana. But don't worry, "you will still need to know Setswana". I'm skeptical, but again, I will figure it out. I am placed about 50km from a couple other volunteers and there are probably about seven or more within 150km. I will not be completely alone! It's great because I can live in my small village with my few amenities, but when I get really desperate I can go crash with people who live in larger villages nearby and have, what I assume will be, nicer places (meaning they might have showers and grocery stores). Or I could have a nice, new, amazing house with all the bells and whistles. I'll be working in the clinic, probably just weighing babies and passing out food for kids until I can figure out what projects the community needs and work on those. I really want to start a garden and do some sort of nutrition workshops but I really can't do anything for the first few months because we're just supposed to be watching, doing our community assessment, and integrating into the community. It's called lockdown, we are not allowed to leave our village at all except to go to our shopping village. Many volunteers break this rule immediately. I went into PC with average to low blood pressure, now I'm pretty sure I'm hypertensive. The amount of salt Mma adds to the food is unreal. I do not even want to purchase salt when I leave Serowe. Food is the main reason I'm pumped to be done with PST. I lucked out with an awesome host family and housing situation, but god almighty I really can't wait to cook for myself, and have my own kitchen. Everyone feels pretty much the same about that. I'm excited to eat food called whole grains (if those even exist here, I'm not too sure), and buy skim milk. Ah yes, the milk. When I first arrived I saw full cream milk in the fridge and just assumed it was for Game, the two year old. Unfortunately, I was wrong. Full cream milk is the norm and you have to go out of your way to find skim milk and pay an extra ten pula. I also am excited to just wake up in the morning, walk out of my room, and be completely alone. In every site each volunteer is supposed to have a counterpart they work with in their village. Well today, all 58 counterparts are supposed to be coming to Serowe for a two day workshop where we talk about our feelings or something along those lines. PC loves having everyone talk about their feelings for extended periods of time, it's really great. We've heard stories of really awful counterparts and really great ones, so it can go either way. We shall see! Talking with everyone else about their host family situation is probably the most common conversation we have with each other as PC trainees. The more we talk the more I realize how awesome my house is. I get fed often, and a lot. My mma isn't overly protective like one I know of, but she still cares a lot and she lets me pretty much do my own thing which I greatly appreciate. She usually cooks every night while I still awkwardly stand in the corner learning how to cook the way she does, and she always over feeds me, unlike some of my starving classmates. If we have extra food we are supposed to bring it for those whose families may not have the most. The only problem (and its not even a problem, really) currently is that she really wants me to go to church with her. And sure you could say "well gosh Christy, this woman took you into her home as a total stranger, the least you could do is go to church with her". Well let me tell you something...she was at church for EIGHT HOURS TODAY. The actual church part is four hours, then the next four they go around preaching to those who can't make it to church. 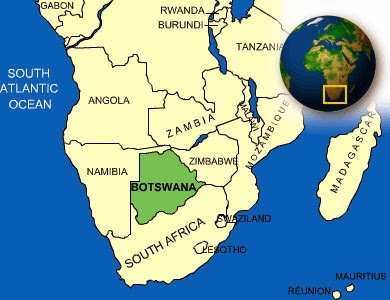 I'm all for expanding my cultural knowledge of Botswana, but no, no thank you. I can hear the church next to my house three nights a week praising Jesus as I try to go to sleep at 8:30pm, so I feel like that is plenty. I explained to her and a couple others today that I just don't go to church, and that blows their minds. Motswana are usually quite religious so it's uncommon to have someone come who isn't. Today was very productive. I got up at sunrise, about 6am (which is common now since I go to bed at roughly 8:30) and took off with a friend to walk pretty much all over the village and to the top of a hill that overlooks everything. Then came home, made an epic egg and tomato sandwich while the kids watched us cook and grabbed egg off our plates with their dirty hands. Oh yes, sanitation. Let's talk about that for a minute. I've realized that it is much better to actual not watch anyone prepare food if you have any sort of standard for cleanliness in the kitchen. It's common for some of the families to cut raw chicken with a knife and then cut a salad without washing the knife. Luckily, my fam is and cleans pretty well. Some of the stuff they don't refrigerate, like mayo, so I went for a while eating it and not even realizing they don't put it in the fridge, and I'm still alive, so that is a relief. Anywho, I also cleaned my room, did my laundry for the first time, and helped Peggy cook dinner. Boom, productivity at its finest.